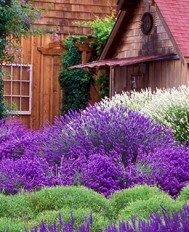 Angustifolias are the traditional English garden lavender. Orders place now are a PRE ORDERS for SPRING 2019-looks like plants will be shipping in May-we will contact you before we ship your order. They have narrow leaves, shorter stems with flower heads that are barrel shaped as opposed to spiky. Their fragrance is sweeter than their hybrid cousins the Lavandins, and because of this, their oil is coveted for aromatherapy and perfume. They bloom earlier in the year than the lavandins. In the winter months, the Angustifolias can often look dead because of the smallness of the leaves. Their dried blossoms are used in cooking, crafting and cosmetics. The Angustifolias produce seeds that are viable, and young plants will often appear below the parent plant. 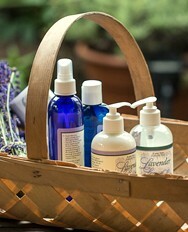 English lavender originated in France and were probably brought to the British Isles by the Romans. It maintains its name because of the significant impact this lavender had on the English oil industry in the 1700s. Click Here to learn more about growing lavender and hardiness zones. Plants will need to be shipped USPS Priority Mail or UPS 3 Day Select if destination is outside of Washington State. Lavender Plants come in a 4" size pot. 18-24" English Lavender, 8" stems; semi-dwarf, compact, deep blue flowers, early-summer blooms, striking in floral displays, small size makes this an excellent choice for borders, pots and small gardens. 18-24" English Lavender, 12"stems, pink flowers with a delicate scent, blooms early summer, a wonderful contrast to garden landscapes and bouquets, a fragrant addition to sachets. This is the number one choice of the cooks at Purple Haze for savory recipes with meats, salad dressings and marinates. 20” English lavender, medium size, deep purple flowers, grey foliage, When it is blooming, more people ask about it than any other lavender. 24-36" English Lavender, 12-15" stems; dark, saturated color, velvety buds, mild scent, early-summer blooms, excellent dried for crafting and display. We use Royal Velvet in our lavender sugar, our lemonade and in dessert dishes that need both color and flavor. 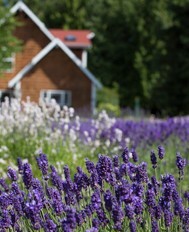 20-24”, English lavender, long flower stems, dark purple blossoms that has a reputation for blooming both profusely and twice each summer. 18-24" English Lavender, 12" stems, sky-blue flowers, sweet fragrance, early summer blooms, outstanding for culinary uses as well as sachets. Aptly named. Sachet is our number one choice for putting in our dryer bags, eye pillows and sachets.